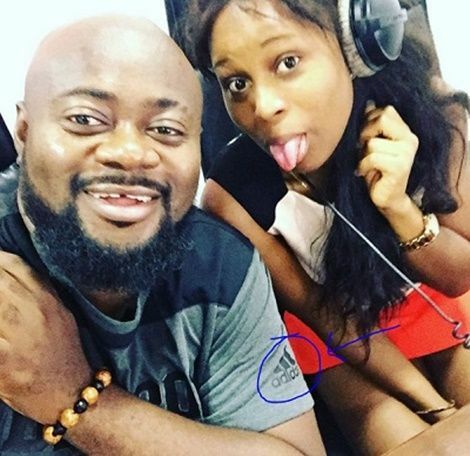 We just came across a photo of Sammy Forson posing with Berla Mundi, and what is he wearing? Shatta Wale is definitely not alone with the fake Adidas struggle. After showing off Tiwa Savage’s fake gear, here’s radio presenter Sammy Forson rocking what looks like ‘Adldas’ instead of ‘Adidas’. Joey B has got to hook up these celebs with original gear, because it looks like they’re throwing away money on the fake ones. For most popular figures, they have connects who do their shopping for them. We wouldn’t be shocked if its the same connect shopping for Shatta Wale and Mr.Forson. This guy is doing some serious ‘chobo’, lol. Outside our borders, we’ve heard of celebs firing their designers or jewelers for getting them fake merchandise. Remember when Ace Hood fired his jeweler after his Rolex fell apart during a BET interview? Over here, the Chinese companies manufacturing the fake gears will never collapse. Business must me booming!